Tired of hauling water around to and from your local fish store to do your water changes? Seatech is now providing valley-wide aquarium water delivery of ultra-purified RO/DI water for both fresh and saltwater aquariums. We have divided the valley into four Areas. See map. Area 1 delivery is on Monday, Area 2 is on Tuesday, Area 3 is on Wednesday and Area 4 is on Thursday. If there is a holiday, we will move deliveries back a day. Cutoff time to ensure delivery is 5 pm the prior day. Orders placed after 5 pm will be moved to the following week. Minimum orders are required. A minimum of $15 is required for each order. This makes it worthwhile to provide delivery services. This minimum could change depending on how many deliveries we have in your Area. Orders are taken by credit card only and water will be left by the front door (unless otherwise noted). Discounts are available for customers on “auto-delivery” and a credit card on file. We have a loyalty rewards program where you can earn FREE water after so many gallons purchased and we also have a referral program. If you refer someone to our services, be sure to have them enter your phone number when ordering. This will also help you earn FREE water. This will also help drive down the minimum required order if these referrals are in the same Area as you. Drivers do not carry cash or checks. ALL ORDERS ARE PREPAID BY CREDIT CARD ONLY. 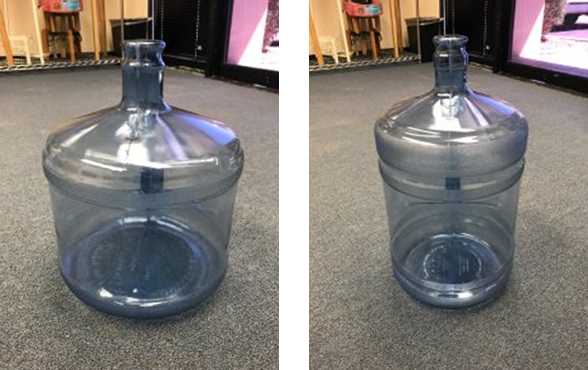 We will require you to purchase either our three or five gallon bottles, however, if you are a repeat customer and have so many bottles in your inventory, we will just change out empty bottles for full bottles and there will be no bottle charges for future orders. For example, if you ordered 15 gallons of saltwater, which are three 5 gallon containers or five 3 gallon containers (you decide when ordering); you will be charged for the water and containers. In two weeks, you then place another order for 15 gallons of saltwater, we will charge you again for the three or five containers and water, but now we will pick up your empty bottles and you have six (5 gallon bottles) or ten (3 gallon bottles) in your inventory. So any future orders of 15 gallons of saltwater or less, we will not charge you for bottles, only for water. We carry a lifetime warranty on the bottles. Once you have enough in inventory for re-delivery, you will never have to pay for bottles again. Unless you order more water than what you have in inventory. vWe use a 5-stage RO/DI unit to filter our water and have Total Dissolved Solids (TDS) meters on our RO/DI filter to monitor our water quality. Our water is ultrapure H2O, meaning all impurities are removed. Our water is not safe for human consumption. Depending on your aquarium setup, you will most likely need to add buffer and/or other additives. If you have any questions, let us know. Seatech is not responsible for contaminated water or water temperature. We do have extreme temperatures here in the valley, it is recommended you let your water sit inside at room temperature for at least 24 hours before doing your water change. We also recommend you check the seal on your container prior to opening. If it is tampered with, please call us and we will re-deliver replacement bottles. Your saltwater bottles will have blue caps and your freshwater bottles will have white caps. For every 150 gallons ordered of freshwater and 100 gallons of saltwater, you will receive 10 gallons FREE. Bottles are free as well. For every 10 gallons of either fresh or saltwater your referral orders, you will earn 1 gallon towards your loyalty total. This will help you earn your FREE water quicker. Boundaries are I10 (where it runs North/South) by airport to the West, Loop 202 to the North, Power Road to the East and Loop 202 to the South. Basically Tempe, Mesa, Gilbert, Chandler and Ahwatukee. Boundaries are I17 to the West, Carefree Highway to the North, Beeline Highway to the East andI10/ Loop 202 to the South. Basically Scottsdale, Paradise Valley, Cave Creek/Carefree, Fountain Hills and North Scottsdale. Do you live outside of this area? Be sure to contact us to learn more about our expanded delivery options. Boundaries are Perryville Road to the West, Carefree Highway to the North, I17 to the East and Northern Ave to the South. Basically Glendale, Peoria, Surprise, Sun City and Arrowhead area. Boundaries are Verrado the West, Northern Ave to the North, I17 to the East and Baseline to the South. It also includes Downtown Phoenix. Basically Goodyear, Litchfield Park, Buckeye, Avondale, Glendale and West Phoenix. Seatech reserves the right to refuse delivery to certain addresses either due to distance, access, safety or other factors. Seatech is not responsible for livestock deaths. Our water is tested daily and used in many other tanks daily. If you think our water caused any deaths of livestock, we will deal it with it on an individual basis. We will check with other water delivered that day and/or used in our tanks to see if there were any other water issues or deaths. We will also require a sample of your water for testing. If it is come to the conclusion that our water did cause any die off, after we’ve tested your water and checked other water used from the same batch as yours, we will replace your livestock. Remember when doing water changes, make sure bottles weren’t tampered with and also make sure water is at room temperature or close to your tank temperature prior to doing a water change. We are very confident in the quality of our water and go to extreme measures to ensure its quality from our location to yours. Please notify us if you need a large water delivery (larger than 100 gallons). We should be able to accommodate you, but will need enough notice (5 business days). Large deliveries are usually done on Friday’s or Saturday’s. Prices, fees, delivery schedules and/or processes can be updated and/or changed at any time. All customers with an email address on file will be notified, but please check our website regularly for updates/changes.